For the past 65 years The Title Team and its parent companies, Modern Abstract & Title, Inc. and Dongarra Title Company, Inc. have provided Title Insurance and Closing Services in Rock County, Wisconsin. The faces and locations have changed but the quality of service and commitment to excellence has never changed. Modern Abstract & Title, Inc. 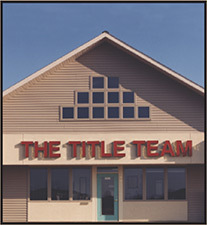 The Title Team has been honored as one of the top Chicago Title and Ticor Title agents in the United States. Only a handful of agents out of a network of over 3,000 were presented the Quality Performance Award. The Title Team received this award for the 9th consecutive year. The Title Team is the only agent that has ever reached this high level of success.